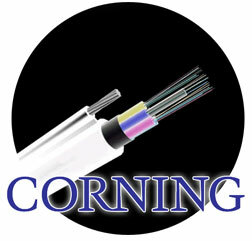 Corning optical cable is the first choice for companies needing top of the line fiber optic and copper cable. Corning optical cable is strong and durable, whether you are seeking single or multi-mode fiber cable solutions. The single-mode Corning Cable FREEDM LST Riser Rated Fiber Cable features easy installation through color-coded buffer tubes and fibers, has a flame-retardant jacket, is fully water blocked for indoor or outdoor use, and is UV-resistant. If multi-mode cable fits your needs, Corning Cable FREEDM LST Fiber Cable, Multi-mode 50 µm might be your choice, with the same great features for strength and protection as the single-mode and is available in 6 12 or 24 fiber count. When seeking factory floor automation, office cabling, or riser cabling you might be looking for Corning Cable MIC Multi-mode 62.5 µm Plenum Cable (1,000 Ft). This flexible plenum distribution cable is impact and crush resistant with tight thermoplastic buffer. Corning Cable MIC Multi-mode 62.5 µm Riser Cables are ideal if you need cabling for workstations and telecommunications rooms. They require no grounding and bonding, and are available with interlocking armor. They meet all application requirements of the National Electrical Code (Article 770)and are FT-4 and OFNR listed. These cables are tight buffered multifiber, with a flame-retardant outer jacket. When approved, they are also available for TEMPEST applications. This tough cabling is also available with Mine Safety & Health Administration approval. Why not fill your cabling requirements today? Choose from the industry leader in tough, flexible cabling, Corning optical cable available at www.TWAcomm.com.